Home / Blog / Advance Your Life Dreams with 20 "Boxes of Possibility"
Advance Your Life Dreams with 20 "Boxes of Possibility"
Today's post is also part of the ongoing series on God's Plan for Your Life Plan, in which we're exploring the 7 Essential Skills of Life Design. 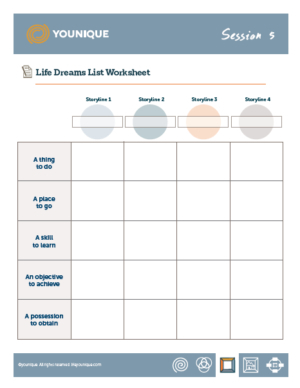 Step three is all about using a simple tool that I call the Life Dreams List Worksheet (You guessed that, didn't you?) But you need to quickly learn two things about the worksheet. First, you need to know about this thing we call "storylines" at Younique. Second you need to learn the five kinds of aspirations that you can have in life. These are the two elements that create the 20 Boxes of Possibility. Essential Life Design Skill #4 is Improve Your Whole Life. It has to do with taking a few simple steps right now toward vitality in all dimensions of life. It's the "all dimensions of life" part that concerns us today. When we have a simple yet comprehensive model of what makes up our life, it makes it so much easier to dream. It stimulates our creativity, and it also prevents us from being imbalanced by focusing all our dreaming in one area of our life and neglecting the others. The tool we use in Younique to get a good look at "all dimensions of life" is called storylines. Storylines are the way we innovate off the idea of "life domains" that practically all life planning systems and intentional life models use. Life domains represent ways that people divide their life into categories like work, family, hobbies, etc. Luke 2:52, for example, records that Jesus grew in wisdom and status and in favor with God and men. This introduces a simple biblical model of the areas of life in which Jesus matured. "Wisdom" represents growing emotionally and intellectually. "Stature" conveys his physical growth. "Favor with God" reveals spiritual and relational development and "favor with men" represents the social and leadership dimensions of our Savior's life. In Younique we survey other common domains and then we make an important pivot. (Which is why I won't cover examples of domains in this post.) We pivot away from domains toward storylines. The primary reason for the pivot is that domain thinking was developed when our lives were defined or limited by the environments we were in. For example, as a teenager, when my dad was at his office, he was exclusively operating in a work domain. When he was home, the same thing: he was at home. But in our current reality of technology and communication, it's all too easy to lead a Fortune 500 company from your sofa at home or spend hours with your friends via technology even though you're at the office. Clearly this new opportunity needs a more savvy way to think about our lives. Using storylines gives you a new freedom and personalization rather than having the same fixed domains for everyone. Think of the storylines as the four primary subplots or themes running through your life. If you binge-watched the TV series of your life for the last year, how would you label those four subplots? Creating four lists of 25 is ten times easier than making one list of 100. And your list will be more well-rounded and God-honoring. How do you accelerate work on your 100 Dreams List? I want you to creatively think of your four storylines right now. How would you name the big narratives in your life? Why is this an important step? Because its going to be ten times easier to get to 100 ideas on your life bucket list when you have four different lists of 25! And best of all, it will help you make a much more well-rounded, God-honoring list. If you are not feeling too creative, that's okay. I would rather have you jump into your 100 Dreams List than be worried about exactly what to call your storylines. For some people that creative step comes easy. Others prefer to use an idea starter or "scaffolding storylines" that we teach at Younique. Most storylines roughly correlate to "health," "love," "work," and "play." (These four categories are used by Life Design teachers Bill Burnett and Dave Evans.) Note that at Younique we don't separate out a "faith" storyline because we see that as integrated into every storyline. So you could think of it as "health-faith," "love-faith," "work-faith." and "play-faith." At the end of this post I will give you the Life Dreams List Worksheet. Your first step will be to either plug in the starter ideas (health, love, work, and play) into your four storyline boxes OR to creatively name your own. You choose. Again, I don't want you to get hung up, because the point is getting on with your list. Now on to the next element that creates the 20 Boxes of Possibility: the five kinds of aspirations. Years ago I wrote a blog series on bucket-listing. (Surprise, surprise!) I was inspired to encourage others while on a week-long dream trip to Santorini Island. Out of that series came one of the most popular posts of the 600 I have written on this blog. If you want you can jump over to it, but I will summarize it below. It described the five kinds of aspirations that you find on a person's bucket list. Aspiration #1: A THING TO DO – The most basic bucket list item is an event or experience. These one-time deals don't usually require training or even extraordinary expense. They just require planning and prioritizing. For example, Dave Rhodes, my cofounder at Younique, finally went skydiving with some friends this year. Aspiration #2: A PLACE TO GO – Like my Santorini trip, maybe you have always wanted take a special vacation. Perhaps it's a crazy destination or some excellent adventure. Or maybe you want to do something simple like visiting every train trestle bridge in your county. Aspiration #3: A SKILL TO LEARN – I have found that most people want to learn something but never take the time to learn. This thing could be a hobby or some kind of personal discipline. Years ago I took a three-day watercoloring class with my wife Romy. I still have a long way to go, but someday I want to be a painter. Aspiration #4: AN OBJECTIVE TO ACHIEVE – Your goal may come in many forms: athletic, financial, professional, etc. Do you want to save your first $10,000 or make extra payments on your mortgage? Do you want to run your first 5K or compete in your first Ironman? Aspiration #5: A POSSESSION TO OBTAIN – Maybe you have always wanted to have something really specific. It could be something you collect, rent, or own. A met a guy once who collected cigar-box guitars. Last week I was with a good friend who wants to own ten rental properties by the time he is age 55. Your 100 Life Dreams List is defined by things to do, places to go, skills to learn, objectives to achieve, and possessions to obtain. Now that you are armed with the knowledge of storylines and the five kinds of aspirations, you are ready to jump into the worksheet. You are not going to believe how this will accelerate your life-dreaming and list-making! The worksheet is a simple matrix with your four storylines across the top and the five kinds of aspirations down the side. That makes a 20-box grid or matrix to use as a brainstorming tool. I call it the "20 Boxes of Possibility." The PDF is a form that can be typed into directly if you like digital, or you can print a hard copy and fill in by hand. Here are some simple steps to use the worksheet which you can download below. By now you should have your first ten ideas written down. Now you can reverse engineer these and place them on the worksheet. NOTE: This step reveals your first inclination with regard to storylines and kinds of life aspirations. Simply note which Boxes of Possibility you gravitated to at first. We will stretch your thinking from there. 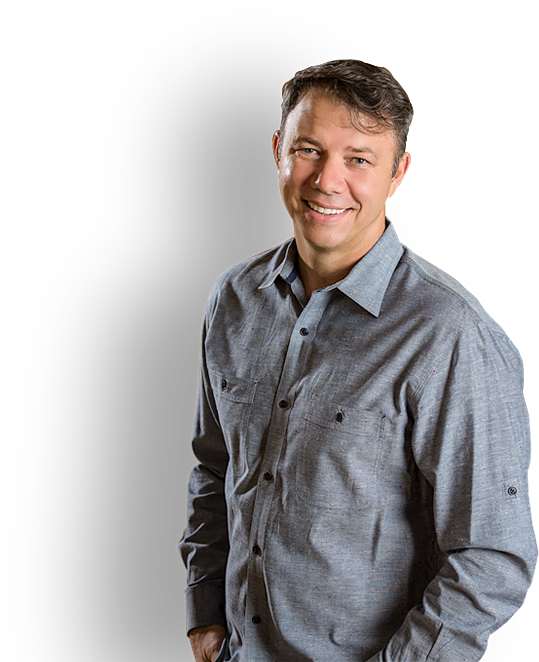 One big secret to making a gospel-centered Life Dream List is using the 20 Boxes of Possibility to explode new ideas for how to walk with Jesus and serve others while you pursue your interests and passions. The storylines help accomplish this step, because they invite you to think holistically about your life. For example, my current life design experiment is living and working 90 days in Aspen, Colorado. This trip was originally developed to help fulfill my Life Dream to snowboard 50 days in one season. Yet this initial idea (an objective to achieve) based on a sport I enjoy explodes with all kinds of meaning when I slow down and reflect. For example, I have enjoyed the opportunity to invest in my niece's only opportunity in life to learn to ski. Hmmmm . . . how many other people might I invest in during my lifetime? And what are the implications for the gospel? It's this simple: Pray then reflect. Write then reflect. Talk about it and then reflect some more until you get to 35 ideas written down. Eat and sleep only if you must. The 35 ideas is a one-third-of-the-way milestone. It's made up of the 10 ideas from your 10-10 List and your new 25 ideas from the Boxes of Possibility. Don't forget to send a picture of your worksheet and use #100Dreams. Critical advice for every age and life stage.